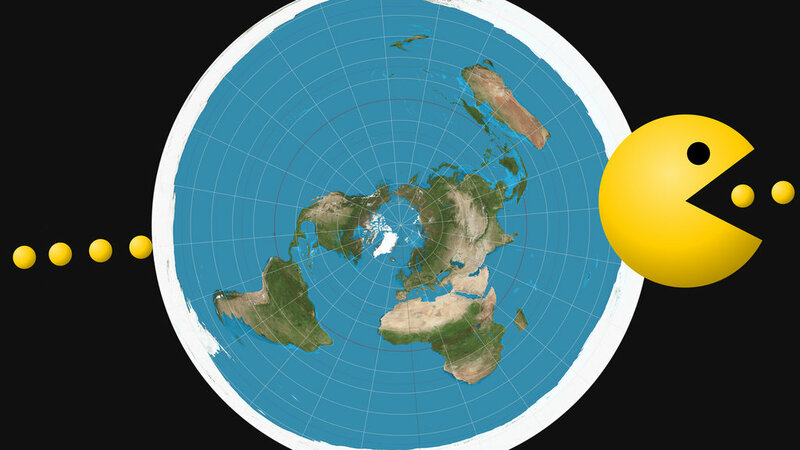 Having spent some quality time looking into the moon landing conspiracies (this is what I do for fun while other people are golfing), the next obvious stop was the narrow world of the flat earth. I imagine many people don’t realize what a big thing this is on Youtube. People make all KINDS of videos trying to sell the flat earth theory, using all kinds of fun pictures and computer graphics, and some of it is fairly convincing. By “some” of it, I mean “almost none of it”, but it’s fun anyway, like those books which dissect things from Star wars so you can see what the inside of Jabba’s sail barge looks like, or how a lightsaber works. After watching a lot of these videos, and asking one of those video makers about his model of earth and space, I discovered an interesting correlation which you will think is sarcasm but is not: Flat Earthers are just like evolutionists, and the flat earth theory is just like the evolution myth. The thing they both have in common, which is the most disappointing, is the fact that they can all be jerks. Admittedly my sample size is low, but I was still hoping that, due to their lack of popularity, the flat earth crowd would be anxious to be friendly and gain some public ground in the popularity contest. You know, like Mormons. Instead, the guy I spoke with, who had make ALL KINDS of long videos about the flat earth, was a real tool. He jumped IMMEDIATELY into calling names and pointing blame and demanding I accept certain propositions, and he refused to answer any of my questions. This has been my normative experience with atheists online. The reason for this was apparent once I put two and two together. He was not only presenting himself as a flat earther, but he was pretending to be a Christian. It all made sense after a while. The whole point of his channel is to give a public face to the slander that Creationists are Flat Earthers. I don’t believe that he was a Christian or a flat earther. He just wanted to be a channel to point to when someone needs evidence that Christians believe in a flat earth. He couldn’t defend or explain the flat earth model he had shown in his videos, and his videos were horribly lacking information or any good use of scripture. The guy was a fraud and a façade. And a real jerk. Seriously. It was really annoying. I tried to be nice and explain that I just wanted to learn about his view, and he was a jerk and a jerk and a jerk until I finally said, never mind you silly person. I didn’t want to know that badly. Similarly, I had to ban an evolutionist from twitter because he was being a jerk who decided- I suppose because he was bored or something- to simply make fun of my creationist view point without giving evidence or replying to anything I sent him. That’s what that wonderful little MUTE button is for. Banished to the land of silent wind and ghosts. And I don’t even know HOW to unmute him! Isn’t that wonderful?!? This Flat earther responded to questions like a lot of atheist/evolutionists do- either with an admission of ignorance, or merely with anger for being asked. They build their weak arguments on logical fallacies and an immediate suspicion of anyone who does not agree with their model, instead of an intellectual defense of their model. Both are more swagger and straw men than anything else, and neither does a good job of answering questions or explaining all of the observable data. Evolutionists and Atheists are basically flat earthers. Let the storm of hate mail begin. If you have comments or questions which are not the hate mail flame war, please feel free. I’d be happy to hear from someone nice, no matter what you believe. This entry was posted in atheism, The Creation SoapBox and tagged atheism, Evolution, flat earth. Bookmark the permalink. There are lots of friendly non-believers out there who don’t want to change anyone’s mind. They are just less vocal. So no hate mail here; at least you aren’t advocating a flat earth! I do not believe the flat earth model- unless I am in Nebraska. In which case, the evidence is overwhelming. And yes, I do not mean to say ALL atheists or Flat earthers are one type of person, only that my experience with them, and perspective on their models, are remarkably similar. Evolution is observed every day in Richard Lenski’s ongoing e. coli experiment at Michigan State. An experiment where in bacteria produce other bacteria for a million generations somehow proves that bacteria produces worms, fish, lizards, and William Shatner? That’s a WEE BIT of a bait and switch, is it not? What you will find is that you have made the (very common) error of mis-defining “Evolution” so that it means any kind of change. But if you really give it some logical thought, you will see that the KIND of changes required to tell the Darwinian fairy tale of fish becoming lizards are NOT based in any observation, but either in wishful thinking or in circular reasoning where in the conclusion is used to interpret the data, and then the interpretation of the data is put forward as evidence for the evolution which was assumed in the first place. Use a little logic and you will see that Evolution is not what you think, and it is, in the end, a false religion which has been already debunked. But thank you for your single sentence of unsubstantiated blanket assertion. The Lenski experiments are not the only evidence for evolution. There are also: 1. Islands that have never been a part of a continent having no terrestrial mammals, amphibians, or freshwater fish; 2. All but one marsupial being native only to Australia; 3. The Geologic Column containing less-evolved fossils the farther down it goes; 4. Comparative anatomy between species; 5. Transitional fossils such as Archaeopteryx, Tiktaalik, and Lucy; 7. The Florida lizard that was observed developing a beneficial toe pad that enabled it to escape an invasive species; 8. Vestigial traits; 9. And species that exist only on isolated locales such as Iceland, Palau, and Madagascar. There is also great similarity in embryonic forms between species. Mammals, birds, reptiles, and fish are all in their own biologic class, but look so similar before birth that it sometimes takes experts to tell them apart. Also, traits of one animal may be present in the embryonic state of a separate animal, even across classes. For example, human embryos have gill slits that disappear before birth. This implies common ancestry with fish and as the branch split, different traits were either further evolved or became vestigial. In another example, whales have a pelvis remnant that is pointless for aquatic travel but which would have served their land-roving ancestors well. 1. How do you know what did or did not live on those islands in the past? Unless you are expecting fossilization to be a normal part of every species, and paleontologists to have extensively searched those islands, this is an assertion which I think you would have a hard time defending. Also, how does this conflict with a post flood, biblial model? From what you said here, this sounds like what I may expect following the flood of Genesis. 2. Platypus fossils have been found in central and south america, and we have two families of marsupial in north america. If they evolved in Australia and didn’t travel from the ark, it seems a wild coincidence that they wandered so far none the less. Maybe pirates brought them here? 3. This claim can only be made once the rock layers are dated using index fossils. So, when you say “the farther down it goes” you MUST mean the further BACK IN TIME, as sometimes the rock layers are found in the “wrong order” according to evolutionism. If you merely literally go further down, you do NOT find the fossils in the order you claim except in small localized areas, which is what the flood model would predict. In order to make the claim you have, you have to FIRST assume evolution is true, and then use the order of appearance and the assumed ages of the species to create the list of index fossils which are used to date the rocks. But this means your claim forces you to use evolution AS EVIDENCE for evolution. Merely digging into the rocks will NOT find the evolutionary sequence you want, and has OFTEN been found to turn evolution on its head. 4. Comparative anatomy merely gives us the tools to create categories for our own ease of cataloging and discussion. Outside of the created kinds which can (or which historically could) interbreed, similarities are NOT evidence of common ancestry, but rather of common design. Certainly the similarities of two kinds of skeleton are an absurd reason to believe that wolves and cabbages share a common ancestor. I recommend the full video of course, but to see the blatant falsification of evidence for the purpose of supporting a theory over fact, skip ahead about 51 minutes and watch it for yourself. 6. There is no 6. It has evolved to be non-functional. 6 is a vestigial example. The loss of this example is the process which resulted in the next three, because you can add information by deleting existing information. 7. This sounds interesting. Send me a link to any articles about this lizard. I’d like to read about it. However, unless this is observed to be the addition of new genes which did not previously exist, this does nothing for the case for evolution. The emergence of a latent trait which was already coded for in the genes of a species is no more evolution that my getting tan when I get a lot of sun. Genes switching on or off, or shuffling of existing genes resulting in new features is NOT the process which could turn fish into lizards. NOT evolution. 9. Species are the variations on a genetic kind. That the existing genes in a kind can be shuffled and disseminated and sometimes lost over time and generations to result in new variations which did not previously exist is NOT the same as a process which creates new GENES that did not previously exist, and without new genes, fish will never become lizards. This is in no way evidence for evolution. As for fossils, no, we do not see transitions. We see fossils which are INTERPRETED to be transitions but, like the three examples given above, given time the scientists who discovered them eventually acknowledge that they are NOT a transition. This has been done to the alleged evolutionary trees for horses, whales, an humans. The problem is, the fact that an alleged transition has been debunked and abandoned takes a VERY long time to get to the internet or textbooks or museum displays. As for the date of alleged transitions- how are they dated? Hopefully you know they cannot be dated using radiodating methods. So how do we know when those fossils formed? We date them by the rock layer they are found in. And who do we date those rock layers (As they are often found out of order)? We use index fossils. But how do we date those index fossils? By using the evolutionary sequence and evolutionary assigned ages and evolutionary story. But when evolution is the foundation for dating methods, how could evolutionists find fossils out of place? It’s circular reasoning which makes itself impossible to invalidate from inside, making it NOT science. It is a religious system where in your faith is the foundation which interprets the facts so that they fit your faith. I recommend you seek out the photographs taken by Michel K Richardson where in he compares modern photographs of embryo stages to Haeckel’s drawings. Carl Sagan used this lie to sell evolution to the kids, and its STILL in textbooks, but if you find evolutionists talking about this, they will be calling it the lie it is, but trying to spin it to say Creationists are trying to misrepresent the point Haeckel was making- ignoring not only his actual work but all of the textbooks which still use his drawings and this false notion that you yourself have here presented in favor of Darwinian Evolution. Its a century old lie which was debunked a LONG time ago, but like Tiktaalik, it’s just not common knowledge yet. People on the internet still think its a valid piece of evidence for evolution when the evolutionary establishment already knows it is not. And please get a book of human anatomy and look up human baby development. We NEVER have gill slits. We have pharyngeal pouch wrinkles which – if you squint just right- look a little like fish gills, but which are never slits/ openings into the baby, and which are never used in respiration and so are nothing like gills. No gills, no slits, no gill slits. It’s another part of this century old lie to sell evolution. I suggest you surf on over to Answers in Genesis and read up on all of these proposed examples of evolution. The house of cards is coming down my friend. But that is good news! Because someday soon you may see that you are made special by a God who loves you. You’re not the latest accidental mutant variation on e coli. You are a human being, made in the image of God, and if you accept his invitation, you can be his child. I’d say its worth looking into. I have never been made worse for reading something and like to frequently get out of my comfort zone and consider different angles, lest I wind up in a echo chamber. Well, it sounds like you have some wisdom my dear MS. That is encouraging. I hope you do consider what I have said and look into the answers I provided (or at least alluded to). Naturally I welcome you to visit and ask me any questions you like. I’m happy to help. And if you feel I have made an error in fact or reasoning, feel free to let me know. I am open to learning as well. I used to be a believer in deep time/Big bang and some ambiguous form of evolution until I did the work of actually looking into it, so suffice it to say, I’ve been wrong before. It can’t hurt to hear what other people have to say. thanks for stopping by.